Cimetidine, sold under the brand name Tagamet among others, is a histamine H2 receptor antagonist that inhibits stomach acid production. It is mainly used in the treatment of heartburn and peptic ulcers. While, in the United Kingdom there is an exception to the POM category where for the short-term symptomatic relief of heartburn, dyspepsia, and hyperacidity. The development of longer-acting H2 receptor antagonists with fewer drug interactions and adverse effects, such as ranitidine and famotidine, decreased the use of cimetidine, and though it is still used, cimetidine is no longer among the more widely used of the H2 receptor antagonists. Cimetidine was discovered in 1971 and came into commercial use in 1977. Cimetidine was approved in the United Kingdom in 1976, and was approved in the United States by the Food and Drug Administration for prescriptions in 1979. Cimetidine is used to inhibit stomach acid production and is used in the treatment of heartburn and peptic ulcers. Some evidence suggests cimetidine could be effective in the treatment of common warts, but more rigorous double-blind clinical trials found it to be no more effective than a placebo. Tentative evidence supports a beneficial role as add-on therapy in colorectal cancer. Cimetidine inhibits ALA synthase activity and hence may have some therapeutic value in preventing and treating acute porphyria attacks. Reported side effects of cimetidine include diarrhea, rashes, dizziness, fatigue, constipation, and muscle pain, all of which are usually mild and transient. It has been reported that mental confusion may occur in the elderly. Because of its hormonal effects, cimetidine rarely may cause sexual dysfunction including loss of libido and erectile dysfunction and gynecomastia (0.1–0.2%) in males during long-term treatment. Rarely, interstitial nephritis, urticaria, and angioedema have been reported with cimetidine treatment. Cimetidine is also commonly associated with transient raised aminotransferase activity; hepatotoxicity is rare. Cimetidine appears to be very safe in overdose, producing no symptoms even with massive overdoses (e.g., 20 g). Cimetidine affects the metabolism of methadone, sometimes resulting in higher blood levels and a higher incidence of side effects, and may interact with the antimalarial medication hydroxychloroquine. Cimetidine can also interact with a number of psychoactive medications, including tricyclic antidepressants and selective serotonin reuptake inhibitors, causing increased blood levels of these drugs and the potential of subsequent toxicity. Following administration of cimetidine, the elimination half-life and area-under-curve of zolmitriptan and its active metabolites were roughly doubled. Cimetidine is a potent inhibitor of tubular creatinine secretion. Creatinine is a metabolic byproduct of creatine breakdown. Accumulation of creatinine is associated with uremia, but the symptoms of creatinine accumulation are unknown, as they are hard to separate from other nitrogenous waste buildups. Like several other medications, the most obvious being erythromycin, cimetidine interferes with the body's metabolization of sildenafil, causing its strength and duration to increase (therefore also its side effects to be more likely and prominent). Clinically significant drug interactions with the CYP1A2 substrate theophylline, the CYP2C9 substrate tolbutamide, the CYP2D6 substrate desipramine, and the CYP3A4 substrate triazolam have all been demonstrated with cimetidine, and interactions with other substrates of these enzymes are likely as well. Cimetidine has been shown clinically to reduce the clearance of mirtazapine, imipramine, timolol, nebivolol, sparteine, loratadine, nortriptyline, gabapentin, and desipramine in humans. Cimetidine inhibits the renal excretion of metformin and procainamide, resulting in increased circulating levels of these drugs. Interactions of potential clinical importance with cimetidine include warfarin, theophylline, phenytoin, carbamazepine, pethidine and other opioid analgesics, tricyclic antidepressants, lidocaine, terfenadine, amiodarone, flecainide, quinidine, fluorouracil, and benzodiazepines. Cimetidine may decrease the effects of CYP2D6 substrates that are prodrugs, such as codeine, tramadol, and tamoxifen. Cimetidine reduces the absorption of ketoconazole and itraconazole (which require a low pH). Cimetidine has a theoretical but unproven benefit in paracetamol toxicity. This is because N-acetyl-p-benzoquinone imine (NAPQI), a metabolite of paracetamol (acetaminophen) that is responsible for its hepatotoxicity, is formed from it by the cytochrome P450 system (specifically, CYP1A2, CYP2E1, and CYP3A4). The mechanism of action of cimetidine as an antacid is as a histamine H2 receptor antagonist. It has been found to bind to the H2 receptor with a Kd of 42 nM. Cimetidine is a potent inhibitor of certain cytochrome P450 (CYP450) enzymes, including CYP1A2, CYP2C9, CYP2C19, CYP2D6, CYP2E1, and CYP3A4. The drug appears to primarily inhibit CYP1A2, CYP2D6, and CYP3A4, of which it is described as a moderate inhibitor. This is notable since these three CYP450 isoenzymes are involved in CYP450-mediated drug biotransformations; however, CYP1A2, CYP2C9, CYP2C19, CYP2D6, CYP2E1, and CYP3A4 are also involved in the oxidative metabolism of many commonly used drugs. As a result, cimetidine has the potential for a large number of pharmacokinetic interactions. Cimetidine is reported to be a competitive and reversible inhibitor of several CYP450 enzymes, although mechanism-based (suicide) irreversible inhibition has also been identified for cimetidine's inhibition of CYP2D6. It reversibly inhibits CYP450 enzymes by binding directly with the complexed heme-iron of the active site via one of its imidazole ring nitrogen atoms, thereby blocking the oxidation of other drugs. 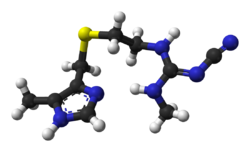 Cimetidine has been found to possess weak antiandrogenic activity at high doses. It directly and competitively antagonizes the androgen receptor (AR), the biological target of androgens like testosterone and dihydrotestosterone (DHT). However, the affinity of cimetidine for the AR is very weak; in one study, it showed only 0.00084% of the affinity of the anabolic steroid metribolone (100%) for the human AR (Ki = 140 µM and 1.18 nM, respectively). In any case, at sufficiently high doses, cimetidine has demonstrated weak but significant antiandrogenic effects in animals, including antiandrogenic effects in the rat ventral prostate and mouse kidney, reductions in the weights of the male accessory glands like the prostate gland and seminal vesicles in rats, and elevated gonadotropin levels in male rats (due to reduced negative feedback on the HPG axis by androgens). In addition to AR antagonism, cimetidine has been found to inhibit the 2-hydroxylation of estradiol (via inhibition of CYP450 enzymes, which are involved in the metabolic inactivation of estradiol), resulting in increased estrogen levels. The medication has also been reported to reduce testosterone biosynthesis and increase prolactin levels in individual case reports, effects which might be secondary to increased estrogen levels. At typical therapeutic levels, cimetidine has either no effect on or causes small increases in circulating testosterone concentrations in men. Any increases in testosterone levels with cimetidine have been attributed to the loss of negative feedback on the HPG axis that results due to AR antagonism. At typical clinical dosages, such as those used to treat peptic ulcer disease, the incidence of gynecomastia (breast development) with cimetidine is very low at less than 1%. In one survey of over 9,000 patients taking cimetidine, gynecomastia was the most frequent endocrine-related complaint but was reported in only 0.2% of patients. At high doses however, such as those used to treat Zollinger–Ellison syndrome, there may be a higher incidence of gynecomastia with cimetidine. In one small study, a 20% incidence of gynecomastia was observed in 25 male patients with duodenal ulcers who were treated with 1,600 mg/day cimetidine. The symptoms appeared after 4 months of treatment and regressed within a month following discontinuation of cimetidine. In another small study, cimetidine was reported to have induced breast changes and erectile dysfunction in 60% of 22 men treated with it. These adverse effects completely resolved in all cases when the men were switched from cimetidine to ranitidine. A study of the United Kingdom General Practice Research Database, which contains over 80,000 men, found that the relative risk of gynecomastia in cimetidine users was 7.2 relative to non-users. People taking a dosage of cimetidine of greater than or equal to 1,000 mg showed more than 40 times the risk of gynecomastia than non-users. The risk was highest during the period of time of 7 to 12 months after starting cimetidine. The gynecomastia associated with cimetidine is thought to be due to blockade of ARs in the breasts, which results in estrogen action unopposed by androgens in this tissue, although increased levels of estrogens due to inhibition of estrogen metabolism is another possible mechanism. Cimetidine has also been associated with oligospermia (decreased sperm count) and sexual dysfunction (e.g., decreased libido, erectile dysfunction) in men in some research, which are hormonally related similarly. In accordance with the very weak nature of its AR antagonistic activity, cimetidine has shown minimal effectiveness in the treatment of androgen-dependent conditions such as acne, hirsutism (excessive hair growth), and hyperandrogenism (high androgen levels) in women. As such, its use for such indications is not recommended. Notes: (1) Human skin fibroblasts used for assays. (2) Situation in vivo is different for flutamide and spironolactone due biotransformation. (3) Conflicting findings for spironolactone. Sources: See template. Cimetidine is rapidly absorbed regardless of route of administration. The oral bioavailability of cimetidine is 60 to 70%. The onset of action of cimetidine when taken orally is 30 minutes, and peak levels occur within 1 to 3 hours. Cimetidine is widely distributed throughout all tissues. It is able to cross the blood–brain barrier and can produce effects in the central nervous system (e.g., headaches, dizziness, somnolence). The volume of distribution of cimetidine is 0.8 L/kg in adults and 1.2 to 2.1 L/kg in children. Its plasma protein binding is 13 to 25% and is said to be without pharmacological significance. Cimetidine undergoes relatively little metabolism, with 56 to 85% excreted unchanged. It is metabolized in the liver into cimetidine sulfoxide, hydroxycimetidine, and guanyl urea cimetidine. The major metabolite of cimetidine is the sulfoxide, which accounts for about 30% of excreted material. Cimetidine is rapidly eliminated, with an elimination half-life of 123 minutes, or about 2 hours. It has been said to have a duration of action of 4 to 8 hours. The medication is mainly eliminated in urine. Cimetidine, approved by the FDA for inhibition of gastric acid secretion, has been advocated for a number of dermatological diseases. Cimetidine was the prototypical histamine H2 receptor antagonist from which the later members of the class were developed. Cimetidine was the culmination of a project at Smith, Kline and French (SK&F) Laboratories in Welwyn Garden City (now part of GlaxoSmithKline) by James W. Black, C. Robin Ganellin, and others to develop a histamine receptor antagonist to suppress stomach acid secretion. This was one of the first drugs discovered using a rational drug design approach. Sir James W. Black shared the 1988 Nobel Prize in Physiology or Medicine for the discovery of propranolol and also is credited for the discovery of cimetidine. At the time (1964), histamine was known to stimulate the secretion of stomach acid, but also that traditional antihistamines had no effect on acid production. In the process, the SK&F scientists also proved the existence of histamine H2 receptors. The SK&F team used a rational drug-design structure starting from the structure of histamine — the only design lead, since nothing was known of the then hypothetical H2 receptor. Hundreds of modified compounds were synthesized in an effort to develop a model of the receptor. The first breakthrough was Nα-guanylhistamine, a partial H2 receptor antagonist. From this lead, the receptor model was further refined and eventually led to the development of burimamide, the first H2 receptor antagonist. Burimamide, a specific competitive antagonist at the H2 receptor, 100 times more potent than Nα-guanylhistamine, proved the existence of the H2 receptor. Burimamide was still insufficiently potent for oral administration, and further modification of the structure, based on modifying the pKa of the compound, led to the development of metiamide. Metiamide was an effective agent; it was associated, however, with unacceptable nephrotoxicity and agranulocytosis. The toxicity was proposed to arise from the thiourea group, and similar guanidine analogues were investigated until the ultimate discovery of cimetidine. The compound was synthesized in 1972 and evaluated for toxicology by 1973. It passed all trials. Cimetidine was first marketed in the United Kingdom in 1976, and in the U.S. in August 1977; therefore, it took 12 years from initiation of the H2 receptor antagonist program to commercialization. By 1979, Tagamet was being sold in more than 100 countries and became the top-selling prescription product in the U.S., Canada, and several other countries. In November 1997, the American Chemical Society and the Royal Society of Chemistry in the U.K. jointly recognized the work as a milestone in drug discovery by designating it an International Historic Chemical Landmark during a ceremony at SmithKline Beecham's New Frontiers Science Park research facilities in Harlow, England. The commercial name "Tagamet" was decided upon by fusing the two words "antagonist" and "cimetidine". Subsequent to the introduction onto the U.S. drug market, two other H2 receptor antagonists were approved, ranitidine (Zantac, Glaxo Labs) and famotidine (Pepcid, Yamanouchi, Ltd.) Cimetidine became the first drug ever to reach more than $1 billion a year in sales, thus making it the first blockbuster drug. In a deal expected to take effect in 2012, GlaxoSmithKline sold Tagamet and 16 other brands to Prestige Brands. Tagamet has now been largely replaced by the proton pump inhibitors for treating peptic ulcers, but is now available as an over-the-counter medicine for heartburn in many countries. ^ a b c d Anita Gupta; Nina Singh-Radcliff (12 March 2013). Pharmacology in Anesthesia Practice. Oxford University Press. pp. 177–. ISBN 978-0-19-934399-7. ^ a b c Elks J (14 November 2014). The Dictionary of Drugs: Chemical Data: Chemical Data, Structures and Bibliographies. Springer. pp. 275–. ISBN 978-1-4757-2085-3. ^ a b c d e f g h i j Jerrold B. Leikin; Frank P. Paloucek (1995). Poisoning & Toxicology Handbook, 1995-1996. Lexi-Comp, Incorporated. p. 184. ISBN 978-0-916589-08-0. ^ a b c Frank J. Dowd; Bart Johnson; Angelo Mariotti (3 September 2016). Pharmacology and Therapeutics for Dentistry - E-Book. Elsevier Health Sciences. pp. 406–. ISBN 978-0-323-44595-5. ^ a b c d e f g h i j Profiles of Drug Substances, Excipients and Related Methodology. Academic Press. 24 October 1984. pp. 176–. ISBN 978-0-08-086108-1. ^ a b c Vallerand AH, Sanoski CA, Deglin JH (25 May 2016). Davis's Drug Guide for Nurses. F.A. Davis. pp. 636–. ISBN 978-0-8036-5779-3. ^ Index Nominum 2000: International Drug Directory. Taylor & Francis. January 2000. pp. 234–. ISBN 978-3-88763-075-1. ^ a b Morton I, Morton IK, Hall JM (31 October 1999). Concise Dictionary of Pharmacological Agents: Properties and Synonyms. Springer Science & Business Media. pp. 77–. ISBN 978-0-7514-0499-9. ^ Burchum J, Rosenthal L (2 December 2014). Lehne's Pharmacology for Nursing Care. Elsevier Health Sciences. pp. 952–. ISBN 978-0-323-34026-7. ^ BNF. "CIMETIDINE". National Institute for health and Care Excellence. ^ Fischer J, Ganellin CR (24 August 2010). Analogue-based Drug Discovery II. John Wiley & Sons. p. 4. ISBN 978-3-527-63212-1. ^ Fischer, Janos; Ganellin, C. Robin (2006). Analogue-based Drug Discovery. John Wiley & Sons. p. 444. ISBN 9783527607495. ^ Fit KE, Williams PC (July 2007). "Use of histamine2-antagonists for the treatment of verruca vulgaris". The Annals of Pharmacotherapy. 41 (7): 1222–6. doi:10.1345/aph.1H616. PMID 17535844. ^ Glass AT, Solomon BA (June 1996). "Cimetidine therapy for recalcitrant warts in adults". Archives of Dermatology. 132 (6): 680–2. doi:10.1001/archderm.1996.03890300108014. PMID 8651718. ^ Karabulut AA, Sahin S, Ekşioglu M (April 1997). "Is cimetidine effective for nongenital warts: a double-blind, placebo-controlled study". Archives of Dermatology. 133 (4): 533–4. doi:10.1001/archderm.133.4.533. PMID 9126017. ^ Deva S, Jameson M (15 August 2012). "Histamine type 2 receptor antagonists as adjuvant treatment for resected colorectal cancer". The Cochrane Database of Systematic Reviews. 8 (8): CD007814. doi:10.1002/14651858.CD007814.pub2. PMID 22895966. ^ Whatley, SD; Badminton, MN; Pagon, RA; Adam, MP; Ardinger, HH; Wallace, SE; Amemiya, A; Bean, LJH; Bird, TD; Ledbetter, N; Mefford, HC; Smith, RJH; Stephens, K (2013). Acute Intermittent Porphyria. University of Washington, Seattle. PMID 20301372. ^ a b c d e f g Ritter J, Lewis L, Mant T, Ferro A (25 April 2008). A Textbook of Clinical Pharmacology and Therapeutics (5 ed.). CRC Press. pp. 250–. ISBN 978-1-4441-1300-6. ^ Sawyer D, Conner CS, Scalley R (February 1981). "Cimetidine: adverse reactions and acute toxicity". American Journal of Hospital Pharmacy. 38 (2): 188–97. PMID 7011006. ^ Sabesin SM (1993). "Safety issues relating to long-term treatment with histamine H2-receptor antagonists". Alimentary Pharmacology & Therapeutics. 7 Suppl 2: 35–40. doi:10.1111/j.1365-2036.1993.tb00597.x. PMID 8103374. ^ a b c Kelly D (26 January 2009). Diseases of the Liver and Biliary System in Children. John Wiley & Sons. pp. 224–. ISBN 978-1-4443-0054-3. ^ a b c d Dart RC (2004). Medical Toxicology. Lippincott Williams & Wilkins. pp. 402–. ISBN 978-0-7817-2845-4. ^ Furst DE (June 1996). "Pharmacokinetics of hydroxychloroquine and chloroquine during treatment of rheumatic diseases". Lupus. 5 Suppl 1: S11–5. doi:10.1177/096120339600500104. PMID 8803904. ^ See complete drug interactions for Zomig (zolmitriptan succinate used for migraine relief) in package insert: "Highlights of Zomig Prescribing Information" (PDF). AstraZeneca. ^ Urakami Y, Kimura N, Okuda M, Masuda S, Katsura T, Inui K (June 2005). "Transcellular transport of creatinine in renal tubular epithelial cell line LLC-PK1". Drug Metabolism and Pharmacokinetics. 20 (3): 200–5. doi:10.2133/dmpk.20.200. PMID 15988122. ^ Rodrigues AD (8 February 2008). Drug-Drug Interactions, Second Edition. CRC Press. pp. 277, 294. ISBN 978-0-8493-7594-1. ^ a b Shufeng Zhou (6 April 2016). Cytochrome P450 2D6: Structure, Function, Regulation and Polymorphism. CRC Press. pp. 299–. ISBN 978-1-4665-9788-4. ^ a b Rosenfeld GC, Loose DS (2007). Pharmacology. Lippincott Williams & Wilkins. pp. 202–. ISBN 978-0-7817-8074-2. ^ Fuller MA, Sajatovic M (2005). Drug Information Handbook for Psychiatry. Lexi-Comp. p. 285. ISBN 9781591951148. ^ Cameron R, Feuer G, de la Iglesias F (6 December 2012). Drug-Induced Hepatotoxicity. Springer Science & Business Media. pp. 140–. ISBN 978-3-642-61013-4. ^ a b Richards DA (1983). "Comparative pharmacodynamics and pharmacokinetics of cimetidine and ranitidine". Journal of Clinical Gastroenterology. 5 Suppl 1: 81–90. doi:10.1097/00004836-198312001-00008. PMID 6317740. ^ Neville N. Osborne (22 October 2013). Selected Topics from Neurochemistry. Elsevier Science. pp. 297–. ISBN 978-1-4832-8635-8. ^ a b c d e Lemke TL, Williams DA (2008). Foye's Principles of Medicinal Chemistry. Lippincott Williams & Wilkins. pp. 273–. ISBN 978-0-7817-6879-5. ^ a b Karalliedde LD, Clarke SF, Collignon U, Karalliedde J (29 January 2010). Adverse Drug Interactions: A Handbook for Prescribers. CRC Press. pp. 633–. ISBN 978-0-340-92769-4. ^ Priskorn M, Larsen F, Segonzac A, Moulin M (1997). "Pharmacokinetic interaction study of citalopram and cimetidine in healthy subjects". European Journal of Clinical Pharmacology. 52 (3): 241–2. doi:10.1007/s002280050282. PMID 9218934. ^ Martínez C, Albet C, Agúndez JA, Herrero E, Carrillo JA, Márquez M, Benítez J, Ortiz JA (April 1999). "Comparative in vitro and in vivo inhibition of cytochrome P450 CYP1A2, CYP2D6, and CYP3A by H2-receptor antagonists". Clinical Pharmacology and Therapeutics. 65 (4): 369–76. doi:10.1016/S0009-9236(99)70129-3. PMID 10223772. ^ Delafuente JC (November 2003). "Understanding and preventing drug interactions in elderly patients". Critical Reviews in Oncology/Hematology. 48 (2): 133–43. doi:10.1016/j.critrevonc.2003.04.004. PMID 14607376. ^ a b Cairns D (2012). Essentials of Pharmaceutical Chemistry. Pharmaceutical Press. pp. 110–. ISBN 978-0-85369-979-8. Drugs interacting in this way with CYP450 include the histamine H2-receptor antagonist cimetidine, [...] Reversible inhibitors, such as cimetidine, which interact with the complexed iron at the active site of the enzyme to inhibit oxidation of other drugs. The inhibition occurs before any oxidation of the inhibitor occurs and is reversible once the inhibitor is removed. ^ Becker KL (2001). Principles and Practice of Endocrinology and Metabolism. Lippincott Williams & Wilkins. pp. 1196–. ISBN 978-0-7817-1750-2. ^ Jensen RT, Collen MJ, McArthur KE, Howard JM, Maton PN, Cherner JA, Gardner JD (November 1984). "Comparison of the effectiveness of ranitidine and cimetidine in inhibiting acid secretion in patients with gastric hypersecretory states". The American Journal of Medicine. 77 (5B): 90–105. PMID 6150641. ^ Biagi P, Milani G (March 1985). "[Dysfunction of the hypothalamo-hypophyseal-gonadal axis induced by histamine H2 antagonists. Review of the literature and personal observations]". Minerva Medica (in Italian). 76 (12): 579–86. PMID 3921876. ^ Winters SJ, Banks JL, Loriaux DL (March 1979). "Cimetidine is an antiandrogen in the rat". Gastroenterology. 76 (3): 504–8. PMID 428705. ^ Sivelle PC, Underwood AH, Jelly JA (March 1982). "The effects of histamine H2 receptor antagonists on androgen action in vivo and dihydrotestosterone binding to the rat prostate androgen receptor in vitro". Biochemical Pharmacology. 31 (5): 677–84. doi:10.1016/0006-2952(82)90449-X. PMID 6123322. ^ Eil C, Edelson SK (July 1984). "The use of human skin fibroblasts to obtain potency estimates of drug binding to androgen receptors". J. Clin. Endocrinol. Metab. 59 (1): 51–5. doi:10.1210/jcem-59-1-51. PMID 6725525. ^ a b c d e f Arnold A. Gerall; Howard Moltz; Ingeborg L. Ward (11 November 2013). Sexual Differentiation. Springer Science & Business Media. pp. 207–. ISBN 978-1-4899-2453-7. In high concentrations cimetidine acts as a weak antiandrogen by competitively binding to cytosol androgen receptors, as has been demonstrated in rat ventral prostate (Foldesy, Vanderhoof, & Hahn, 1985; Sivelle, Underwood, & Jelly, 1982) and mouse kidney tissue (Funder & Mercer, 1979). In vivo, cimetidine, in high dose levels, causes reductions in prostate and seminal vesicle weights in male rats (Foldesy et al., 1985; Leslie & Walker, 1977; Sivelle et al., 1982). After 6 weeks of daily cimetidine administration to male rats, reduced weights of accessory sexual organs were accompanied by elevated gonadotropin levels (Baba, Paul, Pollow, Janetschek, & Jacobi, 1981). At therapeutic levels in men, cimetidine either has no effect on plasma T levels (Spona et al., 1987; Stubbs et al., 1983) or causes small increases in T (Peden, Boyd, Browning, Saunders, & Wormsley, 1981; Van Thiel, Gavaler, Smith, & Paul, 1979; Wang, Lai, Lam, & Yeung, 1982). The increases in T have been attributed to cimetidine's antagonism of the normal negative feedback that androgens exert on gonadotropin secretion (Peden, Cargill, Browning, Saunders, & Wormsley, 1979). Gynecomastia and even loss of libido that progressed to impotence have occasionally been reported in men taking cimetidine (Peden et al., 1979; Spence & Celestin, 1979), but the occurrence of these disorders is very rare (Gifford, Aeugle, Myerson, & Tannenbaum, 1980). In one survey, gynecomastia, the most frequent endocrine-related complaint, was reported in only 0.2% of over 9,000 patients taking cimetidine (Gifford et al., 1980). ^ a b c Stefan S. du Plessis; Ashok Agarwal; Edmund S. Sabanegh, Jr. (26 July 2014). Male Infertility: A Complete Guide to Lifestyle and Environmental Factors. Springer. pp. 233–. ISBN 978-1-4939-1040-3. Like other antiandrogens, [cimetidine] leads to elevated gonadotropin levels by antagonizing the negative feedback control of gonadotropin secretion by testosterone [1, 34]. Cimetidine has been reported to have antiandrogenic effects ranging from gynecomastia to oligospermia . In one clinical study, men administered cimetidine exhibited a significant reduction in sperm concentration compared to placebo-treated controls . In another study of men receiving cimetidine for chronic duodenal ulcers, testosterone and FSH were elevated during treatment with cimetidine compared to both pre- and posttreatment levels. Moreover, these hormonal effects were associated with a reduction in mean sperm count compared to the period after drug withdrawal . ^ Galbraith RA, Michnovicz JJ (August 1989). "The effects of cimetidine on the oxidative metabolism of estradiol". The New England Journal of Medicine. 321 (5): 269–74. doi:10.1056/NEJM198908033210501. PMID 2747769. ^ Michnovicz JJ, Galbraith RA (February 1991). "Cimetidine inhibits catechol estrogen metabolism in women". Metabolism. 40 (2): 170–4. doi:10.1016/0026-0495(91)90169-W. PMID 1988774. ^ Pescovitz OH, Walvoord EC (6 June 2007). When Puberty is Precocious: Scientific and Clinical Aspects. Springer Science & Business Media. pp. 203–. ISBN 978-1-59745-499-5. ^ Cuhaci N, Polat SB, Evranos B, Ersoy R, Cakir B (March 2014). "Gynecomastia: Clinical evaluation and management". Indian Journal of Endocrinology and Metabolism. 18 (2): 150–8. doi:10.4103/2230-8210.129104. PMC 3987263. PMID 24741509. ^ Rendic S, Di Carlo FJ (2010). "Human cytochrome P450 enzymes: a status report summarizing their reactions, substrates, inducers, and inhibitors". Drug Metabolism Reviews. 29 (1–2): 413–580. doi:10.3109/03602539709037591. PMID 9187528. ^ a b c d e f g h i j Deepinder F, Braunstein GD (September 2012). "Drug-induced gynecomastia: an evidence-based review". Expert Opin Drug Saf. 11 (5): 779–95. doi:10.1517/14740338.2012.712109. PMID 22862307. Cimetidine. Spence and Celestin reported a 20% incidence of gynecomastia in a prospective study of 25 male duodenal ulcer patients treated with cimetidine 1.6 g/day . Symptoms developed after 4 months of treatment and regressed within a month of stopping therapy. In another prospective cohort study involving 22 patients, cimetidine caused breast changes and erectile dysfunction in 60% of men which resolved completely in all cases when switched to ranitidine . In the UK general practice database of over 80,000 men, the relative risk (RR) of gynecomastia among cimetidine users was 7.2 (95% confidence interval (CI 4.5 -- 11.3) as compared with the non-users. Users with a daily dose ‡ 1000 mg had more than 40 times the risk of developing gynecomastia than the non-users. The period of highest risk was 7 -- 12 months after starting cimetidine treatment . Cimetidine blocks the androgen receptors in the breast leading to decreased androgen action causing the growth of breast tissue because of ‘unopposed’ estrogen action . Another possible mechanism includes decreased 2-hydroxylation of estrogen leading to elevated serum estrogen levels . There also are reports of cimetidine blocking testosterone biosynthesis and causing elevated prolactin levels in individual cases . ^ a b c Stephanie Watts; Carl Faingold; George Dunaway; Lynn Crespo (1 April 2009). Brody's Human Pharmacology - E-Book. Elsevier Health Sciences. pp. 472–. ISBN 978-0-323-07575-6. The histamine receptor antagonist cimetidine, used to decrease gastric acid secretion in treatment of peptic ulcer disease and esophagitis (see Chapter 14), also acts as an antiandrogen. Thus it has been reported to produce gynecomastia when given in large doses, such as those used in the treatment of patients with Zollinger-Ellison syndrome. Gynecomastia occurs in less than 1% of patients treated with the doses used in peptic ulcer disease. Cimetidine interacts with ARs approximately 0.01% as effectively as testosterone and has been used with limited effectiveness to treat hirsutism in women. ^ Albert Altchek; Liane Deligdisch; Nathan Kase (4 September 2003). Diagnosis and Management of Ovarian Disorders. Academic Press. pp. 351–. ISBN 978-0-08-049451-7. Cimetidine is a weak androgen receptor antagonist. A controlled clinical study has not found cimetidine to be effective in the treatment of hyperandrogenism. [123, 124] 5. ^ a b Janet P. Pregler; Alan H. DeCherney (2002). Women's Health: Principles and Clinical Practice. PMPH-USA. pp. 595–. ISBN 978-1-55009-170-0. Cimetidine is a histamine type 2 blocker, which also binds to the androgen receptor to inhibit its function." However, this antiandrogen activity of cimetidine is weak, and the clinical benefit of its use in women with hirsutism is minimal. Thus, this drug is not recommended for the treatment of hyperandrogenism. ^ a b Katsambas AD, Dessinioti C (2010). "Hormonal therapy for acne: why not as first line therapy? facts and controversies". Clin. Dermatol. 28 (1): 17–23. doi:10.1016/j.clindermatol.2009.03.006. PMID 20082945. ^ Scheinfeld N (March 2003). "Cimetidine: a review of the recent developments and reports in cutaneous medicine". Dermatology Online Journal. 9 (2): 4. PMID 12639457. ^ a b c "Tagamet®: Discovery of Histamine H2-receptor Antagonists". National Historic Chemical Landmarks. American Chemical Society. Archived from the original on December 9, 2012. Retrieved June 25, 2012. ^ a b Fremantle M. "Tagamet". Chemical and Engineering news. Retrieved 1 July 2013. ^ Whitney J (February 2006). "Pharmaceutical Sales 101: Me-Too Drugs". Guernica. Archived from the original on 2008-08-07. Retrieved 2008-07-31. ^ Ranii D (21 December 2011). "GSK sells BC, Goody's and other brands". News & Observer. Archived from the original on 2012-04-15.